A dead aircraft battery is replaced by a truck battery! Much higher capacity! The Fuel tanks had a significant amount of water! airplanes in the best flying training academy in the country, with only VT-EMA, EMB, EMC, EMF, EMH, IGA, IGB, IGD, IGF, and IGG remaining in the aircraft registry. Of these ten, only 5 are still flying today. 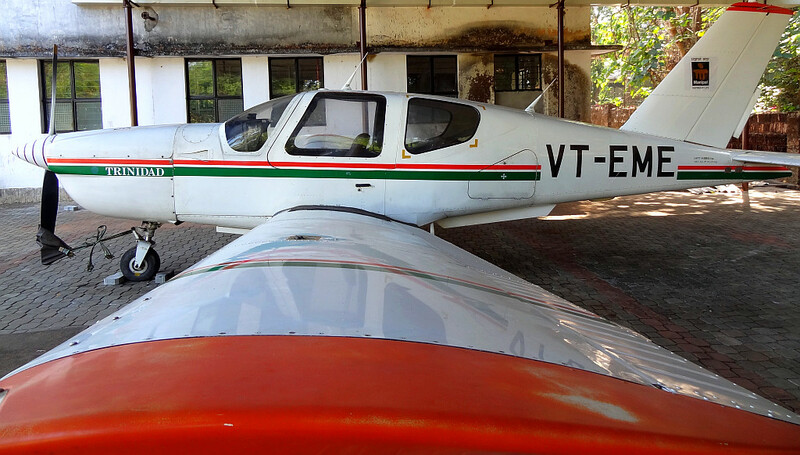 VT-EME, with msn 701, after losing its Certificate of Airworthiness, made its way to Manipal Institute of Technology, Manipal, to serve as an airplane that students may use to study airplane parts, systems and structure at the Aerospace department. After having sat under the sun and the rain for over a year, it was time to bring the TB 20 to life, albeit on the ground only. The biggest hurdle was procuring 100LL Avgas for the aircraft. 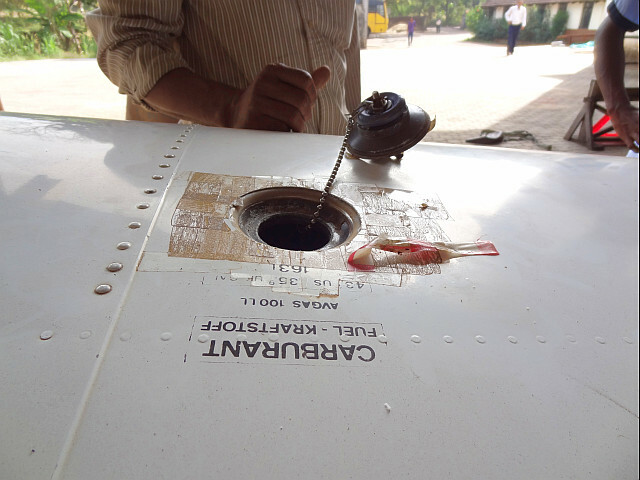 The Chief Engineer at Chimes Aviation Academy, Mr. Santosh Abraham, suggested the use standard petrol in the engine as the airplane was never going to fly again. 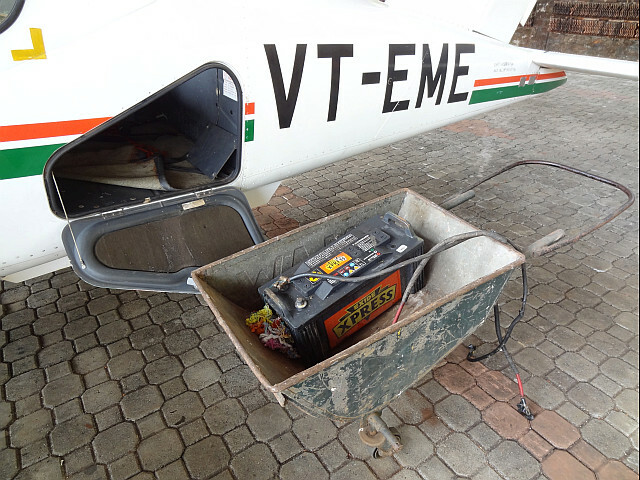 With AVGAS costing around INR 170 per litre, and the easily available standard petrol costing around INR 75 per litre, there was significant savings in time, effort and money. The RPM’s alive! We took it upto 2000, but immediately thereafter had to shut down due to a safety concern. procedures for this airplane, ensuring the safety of the whole operation (which included emergency procedures for engine fire on start), and around 4 failed starts, we brought the engine to life. 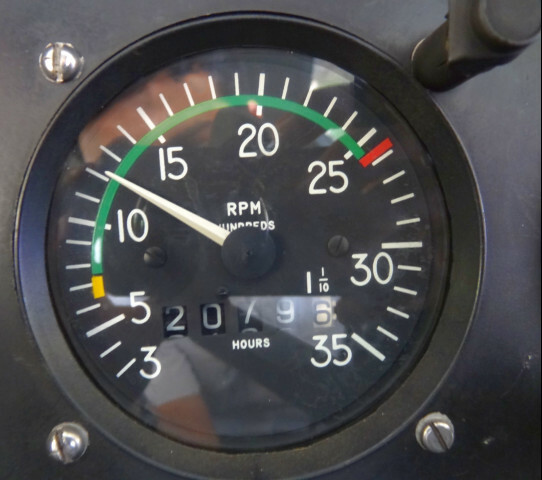 The alternators kicked in, the lights (navigation, anti-collision, and landing lights) turned on, and we took the RPM to almost 2000 rpm, but due to certain issues, could not test the CSU (Constant Speed Unit). 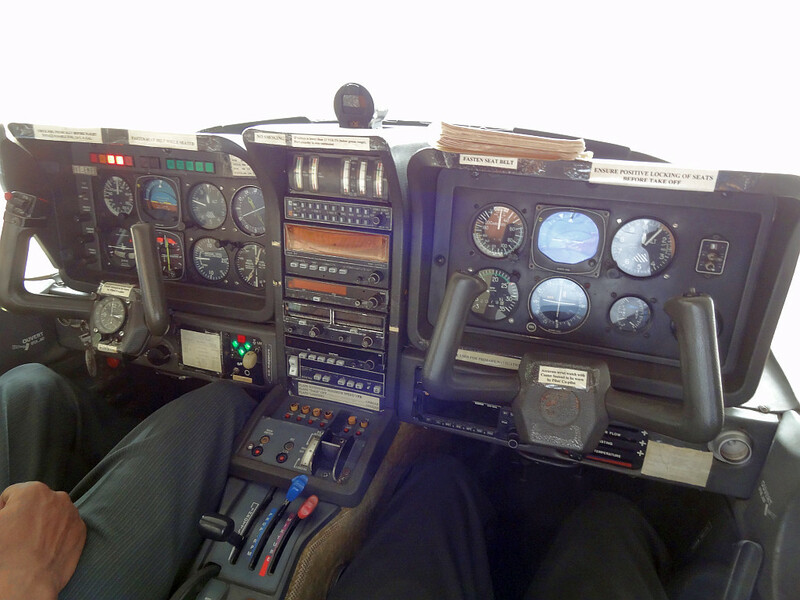 None of the avionics (radios, GPS, RNAV unit, autopilot), unfortunately, could be turned on, as their were all INOP. But the joy of brining an airplane to life, is beyond compare! The Flying Engineer is proud to have helped procure the TB-20, while also coordinating the engine start. From inside, while the prop was spinning on the outside! Congratulations on getting this baby started..!! -EME seems to be in perfect shape also, i’m sure the students at MIT would most definitely want to check her out.! A Very Happy New Year too..!! So did you finally filled the tank with standard petrol? Does that affect any performance of the aircraft? Aircraft is not for flying. Yes, we used standard petrol available at automotive fuel stations. One of the best aircraft I have ever flown. Would love to have a hand on her, if I ever get chance again.